Well it is no secret that we've just come back from 10 wonderful days in Ireland. The West of Ireland to be precise. On Monday, I took my little man swimming, and then once we were dressed we charged out of the pool building, with me not even having thought about drying my hair. Suffice to say I sneezed for the rest of the afternoon, but I was cheered up by my eldest Uncle taking Aaron to see the sheep and cows as below. Between the pool and my Uncle's we did stop at the slides and swings though but I made it brief as I could already tell I was catching a chill. I recovered that night but come Tuesday I washed my hair, and then rushed off with my Aunt to return all the dress suits (we were there for a big Irish wedding). Again, I sneezed for the whole afternoon, but as we then visited my Great Aunt, which led to me playing (in the cold) with Aaron in her garden, my body was less forgiving and I now have flu as a result. I have just this night had TWO lemsips. Yes I know that means I have probably overdosed on paracetamol but right now that is the least of my problems. Not that I have problems, but I want to be able to breathe and sleep tonight. It'd be nice! Anyway, back to the cattle. When told that one of the sheep had a red sore bum (which we saw first hand while being told about it) due to being eaten by maggots, he spoke about that poor sheep for days, to anyone who'd listen. When being told that the calf is breastfeeding in that last photo (I mean being told whilst I was taking it, not now), he announced "I used to do that yesterday". He doesn't know how to say, 2 years ago, or a long time ago bless him. When hearing it my uncle probably thought I am one of those Mums who secretly breastfeeds a 3 year old behind closed doors. No, I don't but he does still have a bottle ;-) and we did breastfeed for 13 months. I strongly believe cow's milk is for cows, so Aaron's always been on soya. 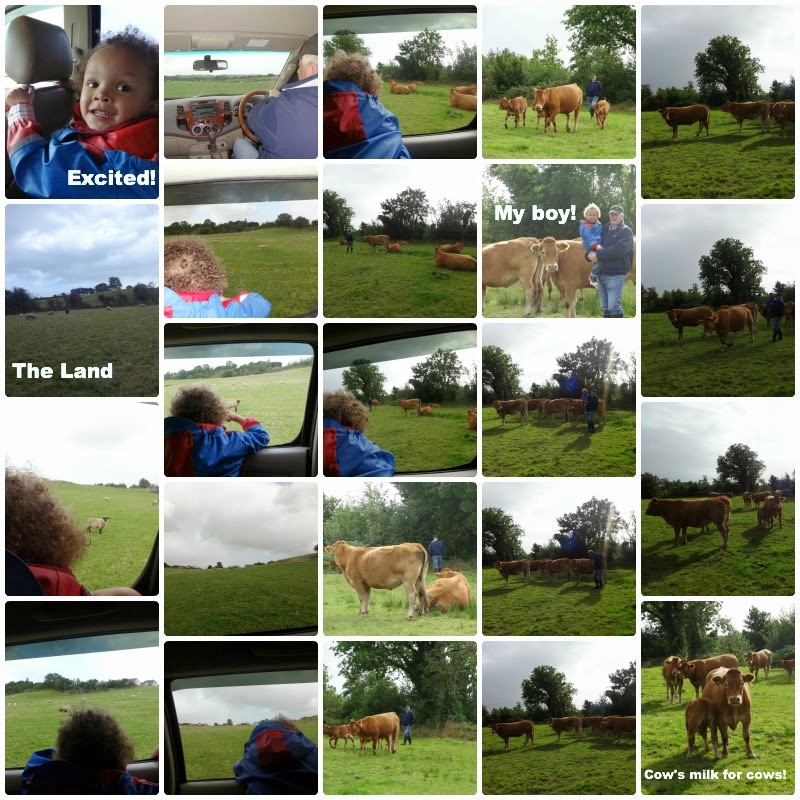 My little man is SUCH a country boy, and an outdoor boy, he really really thrived in Ireland, as he does every time we visit. It is so lovely to see him so happy and so free, in such a free range way. It's also great to get feedback, from friends and family over there. Lovely to get compliments about him, which I sometimes crave over here. I love to hear how good his speech is, how lovely his clothes are, how independent he is. I give him my all, and it is nice to know I am doing SOMETHING right. A big part of our holiday was Aaron spending a lot of time on trampolines. We don't have one of those, but he loves them. Anyway my flu requires that I go to bed, so night night. What a lovely experience for him to have. It obviously had a big impact on him. Hope your feeling better soon. Ah. Tis the season! Lovely photos! I'd love to go to Ireland. Feel better soon! What a great time Aaron had in Ireland being a country boy! The photos are great and your Uncle has some very pretty cows. You have obviously done a very good job bring Aaron up and the compliments prove it. I do hope you feel better soon and thanks for linking up with Country Kids. Looks like Aaron had lots of fun. Such a shame you caught a cold. I've never been to Ireland.....maybe one day! Ireland really is beautiful. Aaron is going to have great memories of your trips!